In the underground city of Caverna the world’s most skilled craftsmen toil in the darkness to create delicacies beyond compare - wines that can remove memories, cheeses that can make you hallucinate and perfumes that convince you to trust the wearer, even as they slit your throat. The people of Caverna are more ordinary, but for one thing: their faces are as blank as untouched snow. Expressions must be learned, and only the famous Facesmiths can teach a person to show (or fake) joy, despair or fear - at a price. The people of Caverna are born without the ability to naturally make facial expressions. Instead they must learn them manually from a ‘Facesmith’. The rich folk, of course, can learn as many intricate expressions as they can afford, such as Face No. 31 Dewdrops Regarded in a Spirit of Hope or No. 29 Uncomprehending Fawn before Hound. The servants and drudges though, are taught only a mild look of grateful subservience. Neverfell, our hero, has a face like glass. Her true emotions flow across it freely and because of this she has been kept hidden away working in the tunnels for her master Grandible the cheesemaker. This all works fine until the day Neverfell gets out. Suddenly she finds herself as a pawn in the middle of a vicious political war between the leading guilds. The head of the Childersin Vintner Family, is the first to realise her value but soon she catches the attention of the Grand Steward, the mad ruler of Caverna. A man made so paranoid by the deceit and conspiracy that surrounds him he has trained his left and right sides to slumber in turn rather than risk giving his enemies the chance to catch him unaware. For a girl who has spoken to only two people her whole life this alone should be enough for her to deal with. But on top of it all there is a thief in Caverna challenging the Grand Steward’s authority; an underclass to be freed; and there is something the famous Facesmith, Madame Appleline is not telling Neverfell. And through all this, the naïve Neverfell is learning exactly how much you cannot trust people’s faces. Normally when I love a book I fly through it, but it turns out it’s really hard picturing someone screaming with rage with a face that’s not contorted in anger but instead bears the expression ‘An Ode To Peppermint’ (Face No. 218). It was an unexpected challenge and I loved it. Caverna itself is a world built in the style of Pratchettesque madness, and like Pratchett’s world it is a world that works completely in every sense. All the problems you would expect to find living in a deep, dark, airless cavern are solved in the most imaginatively logical way possible. Hardinge is not a writer afraid of taking the scenic route with a metaphor and certainly does not shy away from unusual or ‘big’ words. But unlike Lemony Snickett, who’s writing style allows him to stop the story to offer a definition, Hardinge is forced to be cleverer about it and so I found myself at the end of the story with a greatly expanded vocabulary though context alone. As an added bonus, I have had a few parents come back to me after their child has read A Face Like Glass to tell me it has helped them empathise with the problems autistic kids have reading facial expressions. 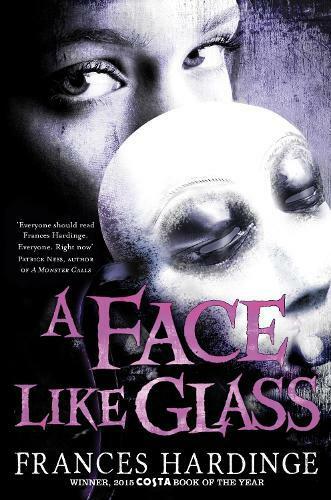 So there is one more reason to read A Face Like Glass! Stunningly original, fabulously inventive and packed with humour and wit - now with a eye-catching new cover look! A triumph of imagination and wordplay. An adventure as fierce and fiery as the volcanoes that rule it ... and the girl that rules them! Now in paperback - launching a stunning new cover look!